"A fascinating account of an unexpected discovery that is changing the way that psychologists and neuroscientists think about everything from language to social interaction." "Marco Iacoboni has written a fascinating and wonderfully accessible account of one of the most exciting developments in recent neuroscience-the discovery of 'mirror neurons.' If you want to know more about the biological basis of empathy, morality, social cognition and self-awareness, read this book." Imagine you are out and about, perhaps doing some shopping, or planning an evening at the movies with friends. Lots of people are around you, coming and going, all busy with their own plans. You look at them, they look at you. Where do you think they are looking, when they look at you? And where do you think you look, when you look at them? Their clothes, their shoes, their handbags? Not at all. We do register those things, of course. For the most part, however, when we look at other people, we look at the face and hands. Our eyes seem glued to those body parts. What is so special about them? Perhaps because the human face shows our emotions, so that it signals how we feel? Perhaps because other people can be potentially harmful with their hands? These are good reasons, of course. But they hardly justify the almost constant fixating at the face and hands that our eyes do. It's possible that we keep fixating the face and hands of other people because those are the best entry points to get into the minds of others. How so? About 20 years ago, a group of brain scientists unexpectedly discovered some weird brain cells. These weird cells are motor cells, that is, they send signals to our muscles to control our actions, as when we grasp a cup of coffee or we smile. The same cells, though, and this is the surprising part, are also activated by the sight of somebody else making the same action. With these weird cells in our brains, it is as if we are looking at ourselves reflected by a mirror, when we look at our fellow humans. For that reason, those weird cells were called mirror neurons. This remarkable discovery suggests that evolution has devised a wonderfully simple mechanism enabling us to empathize with other people with very little effort. My mirror neurons are active both when I reach for that cup of coffee and when I see you doing the same thing. I don't have to make any effort to figure out what is going on in your mind. Indeed, it is almost as if I am doing what you are doing. Of course, that little word, 'almost', means that we still have to do a lot of experiments to figure out exactly how things work! Indeed, there are many aspects of the workings of mirror neurons and how they interact with other brain systems that we don't fully understand yet and need to investigate better. In spite of that, the discovery of mirror neurons sparked excitement and interest well beyond the neurosciences. There are obvious implications regarding human psychology. In contrast with traditional beliefs about human beings as fundamentally selfish, mirror neurons tell us that our nature is fundamentally empathic. This is great news, and news worth propagating. By becoming aware of our empathic predispositions, we can now reflect on them, and this very process may potentially increase our capacity to empathize. There are also complications, however. The human tendency to imitate makes us vulnerable to external influences. The same mirror neurons may make us prone to imitate the violent behavior of other people, or the self-destructive behavior of addiction. A key factor, here, a factor that we still don't understand well but we are actively investigating, is the role of control of imitation and mirroring. 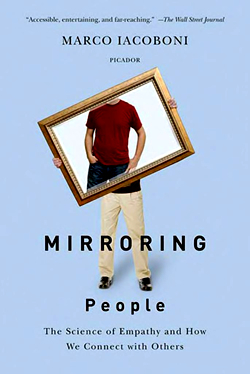 Ideally, you want to boost mirroring to increase empathy in some situations, but control it in some others (as when exposed to violent behavior or addictive behavior). The discovery of mirror neurons has also raised much interest for its philosophical implications. There are three big philosophical issues that are touched by the existence of mirror neurons. One is related to the sense of self. If there are brain cells controlling my actions that also fire up when I see you making your own actions, how do I know who's doing the action? What are the boundaries between me and you, between self and other? The second one is related to free will. If our neural machinery makes us imitate (at least internally) automatically what others do, are we responsible of our own actions? Are we really free as we think we are? The final philosophical implication is perhaps the biggest one, and goes all the way back to Plato's Cave and to the foundations of our thinking about the mind. Our traditional way of thinking about the mind is that it re-presents the world. There is a world out there (the sky, the sun, the clouds, objects, people, animals) that the mind re-presents internally. Here, mental re-presentations are temporally and ontologically secondary to the things that they represent. The way mirror neurons work, however, raise the possibility of an ontological priority of mental representations. This concept challenges conventional wisdom and is potentially radically transformative. Perhaps because of these links with our understanding of the nature of representations, there is a raising interest in the humanities, the media and the performing arts regarding mirror neurons. In about 20 years (indeed, later this year there will be a sort of celebratory meeting on mirror neurons 20 years after the discovery) mirror neurons have managed to go well beyond the neuroscience labs and have touched many aspects of our society. While there is still plenty of things we don't know about these cells and how they interact with other neurons, the excitement and interdisciplinary debate that they generated is already a good legacy. Marco Iacoboni is Professor of Psychiatry and Biobehavioral Sciences at the David Geffen School of Medicine at UCLA. He lives in Los Angeles.